Art Pssst, Wanna Buy a Billboard? 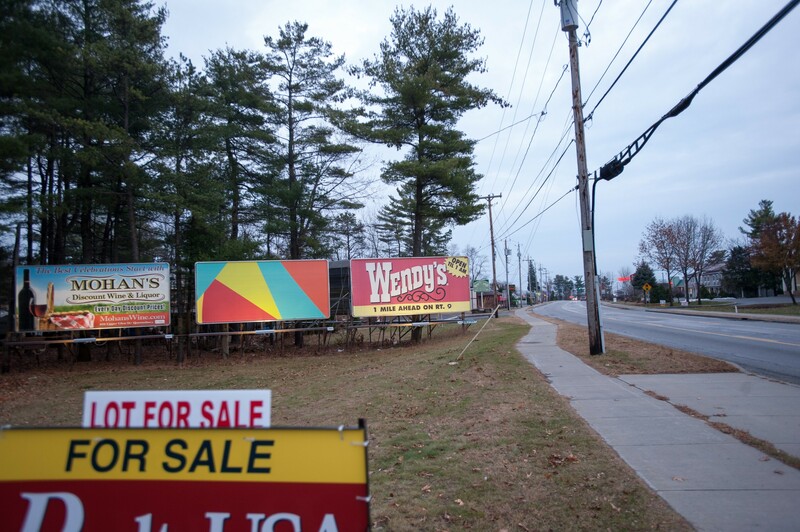 Robert Hitzig's billboard in Queensbury, N.Y.
That headline above is how Montpelier artist Rob Hitzig titled his announcement that, well, he has a billboard for sale. Sure, billboards are illegal in Vermont, but not if you display it in, say, your living room. Or your barn. Hitzig's billboard, you see, is actually art, not an advertisement. He intended it "as an antidote to the barrage of messages we all encounter every day," he writes. "This piece is designed to let the viewer take a mental pause and just 'be.'" If the photo here looks familiar, you probably remember that I wrote about Hitzig's billboard project before on this very blog. For four weeks late last year, Hitzig displayed the vibrant, five-color abstract work on a rented billboard space in Queensbury, N.Y., just south of Lake George. Now it's for sale on eBay. The starting bid? $1,000. Hitzig says he wants to sell the piece in order to fund yet another billboard installation. The work is printed on thin plastic fabric and can be folded to fit in a 20-by-14-by-10-inch box, he says. It weighs less than five pounds. The billboard-size abstractions are an extension of Hitzig's wordless bumper stickers, which for the last couple of years he's been offering free to anyone who promises to put it on their car. "I realized that bumper stickers that talked at me made me feel uncomfortable, even if I agreed with the sentiment," he explains, "so I decided to make bumper stickers that say nothing." Judging from the number of stickers on Vermont vehicles — supporting political candidates or favorite nonprofits, declarations such as "I heart my Saint Bernard," and the hilarious classic, "If you can read this, you're too close" — Hitzig has a long way to go to win over hearts, minds and bumpers. But you can't blame a guy for trying. Or for trying to find a loving new home for his billboard about nothing. Hello, Jerry Seinfeld? What Does This Billboard Say to You?